FILE - Flags from South Korea, left, and China flutter atop an aircraft at Beijing Capital International Airport in China, Sept. 2, 2015. China and South Korea's agreement this week to set aside differences over a U.S. missile defense system, in order to normalize relations after a year-long feud, likely could boost economic ties and stability in northeast Asia. Beijing restricted South Korean business on the mainland and Chinese tourism to the peninsula after Seoul announced in July 2016 that it would allow the United States to deploy the THAAD system to defend against North Korean missile threats. Worried the system could be used to monitor Chinese military activity, Beijing said THAAD was a threat to China's national security interests. "China still strongly argues for withdrawal of THAAD [Terminal High Altitude Area Defense]," said Woo Su-keun, political science professor at Donghua University. "But China also understands South Korea's position, and if China continues to hold its argument, it may not be able to resolve all matters related to South Korea. So, China decided to come out with a position that it will put off the argument. But if a problem occurs due to [the] THAAD issue, there is a possibility China may take it as an issue again." The number of Chinese tourists, who made up about half of South Korea's 13 million visitors from January 2016 to September 2016, dropped to slightly more than 3 million in the same period this year, reducing overall numbers by nearly a quarter. Beijing claimed Chinese tourism companies were acting on their own. FILE - Terminal High Altitude Area Defense (THAAD) interceptors are seen as they arrive at Seongju, South Korea, Sept. 7, 2017. China also is accused of retaliating against several South Korean companies operating in China, including the Lotte group, which provided the land for the THAAD deployment. A return to business as usual is expected after South Korean President Moon Jae-in and Chinese President Xi Jinping meet for a summit this month on the sidelines of the Asia-Pacific Economic Cooperation (APEC) meetings in Da Nang, Vietnam. The South Korean and Chinese militaries are expected to restore dialogue channels soon, which Beijing suspended over the THAAD deployment, reported the South Korean news agency Yonhap. South Korea's nuclear envoy, Lee Do-hoon, went to Beijing on Tuesday for talks with his Chinese counterpart, Kong Xuanyou, on North Korea's nuclear program, reported Yonhap. "For about a year, both countries did not want to, but the relation[ship] has been flowing in a way that neither country wanted," Woo said. "But both countries agreed that if this [kind of] relation continues, they would not be able to properly respond to sudden changes and situations in northeast Asia. So, both countries decided to put off the THAAD issue and [return back to a] prospective posture." North Korea in September carried out its sixth and largest nuclear test, claiming it was a hydrogen bomb that can be mounted on an intercontinental missile. Pyongyang fired a ballistic missile over Japan just days later. 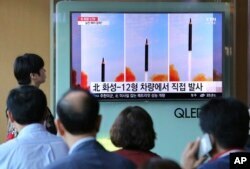 FILE - People watch a TV screen showing a local news program reporting about North Korea's missile launch, at the Seoul Railway Station in Seoul, South Korea, Sept. 16, 2017. Despite tensions with Seoul over THAAD, Beijing has supported tougher sanctions against Pyongyang over its nuclear and missile programs. Beijing in August said it banned imports of North Korean seafood and raw minerals, such as iron, lead and coal, in accordance with United Nations resolutions. VOA reported Tuesday, however, that in September, China imported 509,000 tons of coal, worth $44 million, from North Korea. This raises doubts about whether Beijing is fully implementing U.N. sanctions against Pyongyang. China's Commerce Department spokesman, Gao Feng, said at a briefing last Thursday that goods arriving at Chinese ports prior to the ban still would be cleared through customs, and noted a 30-day grace period for contracts signed before the ban took effect on August 5. It is not clear if China could have received half a million tons of previously contracted North Korean coal in just the first week of September. Further raising eyebrows, Beijing has been allowing banned North Korean ships to enter coal-unloading ports, although it is not clear if any cargo was unloaded, according to a report Wednesday by VOA's Korean service. The South Korea-China detente comes just days ahead of the first visit to the region by Donald Trump as U.S. president. He has been urging unified pressure against North Korea. The U.S. State Department on Tuesday said it was pleased South Korea and China have reconciled following the dispute over the THAAD system. "Of course, the U.S. may show its position that it welcomes improvement of South Korea and China [relations] and it is helpful for stability and prosperity of northeast Asia," said Woo Su-keun. "It may be an opportunity for the U.S. to renew its diplomacy policy for South Korea." South Korean President Moon Jae-in has urged diplomatic engagement with North Korea, while Trump has favored tough language and repeatedly emphasized that all options are on the table, including military action, if the U.S. sees an imminent threat. U.S. Central Intelligence Director Mike Pompeo in October warned that North Korea could be just months away from being able to mount a nuclear device on a missile capable of striking the U.S.
VOA's Youmi Kim contributed to this report.